Your Transformative Journey is an overview of your Heroic Quest to discover your true value and uniqueness. It gives give you an introduction to tools and resources used to create strategies and actions steps so that you can live with purpose. Seek and discover valuable treasure hidden in your subconscious and unconscious minds. Utilise this treasure for your self-improvement and to create a life that makes your heart sing. Share your treasure with others through building meaningful passion-based ventures. Deb Donnell’s lifelong mission is to ensure that you do not die with your treasure still buried inside of you. Author, publisher, NLP Master Practitioner and founder of KESWIN™ Academy. 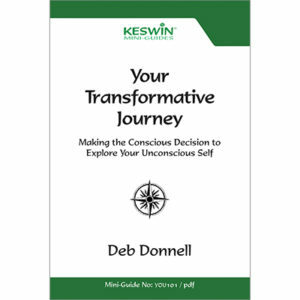 Deb is committed to guiding you safely on your Heroic Quest to create a substantial life.